Leviton 1-Pole Lighted handle toggle AC Quiet switch in white color, is rated at 120-Volts and 20-Amps. It has maximum load capacity of 1 hp at 120-Volts. 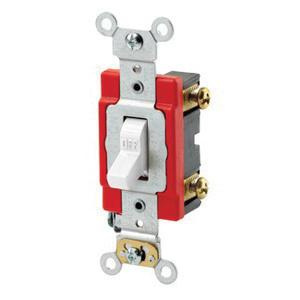 This industrial grade switch features thermoplastic construction. It measures 4.06-Inch x 1.31-Inch. Maintained action switch with back and side-wired connection, accommodates terminal of size 14 - 10-AWG and 14 - 12-AWG. Lighted handle illuminates when load is Off. Fully enclosed switch mechanism in rugged housing ensure better strength, track and arc resistance. Switch withstands dielectric strength of 1500-Volts. Box mount switch features silver alloy contact to offer long life, prevent sticking, welding and excessive pitting. It features 0.48-Inch thick galvanized steel strap. It withstands temperature rating of -40 to 65 deg C. Switch is UL listed, CSA certified, RoHS compliant and meets Federal specification/NEMA/NOM/ANSI standards.